Our expertise is the research on causes of multiple sclerosis (MS), neuromyelitis optica, antibody-associated neuroimmunological disorders as well as brain tumor immunology, in close cooperation with the German Cancer Research Center (DKFZ) and the NCT. The program focuses on the translation of basic research into clinical practice (bench to bedside) through national and international multi-center studies developing novel, targeted therapies. The neuroimmunological outpatient clinic has been certified as a ’recognized MS Center’ by the German Multiple Sclerosis Association (DMSG). In recent years, the Neuroimmunology program gained essential stimuli with regard to structure, basic science, and patient care. Along with the departments of Neurooncology and General Neurology, the respective Neuroimmunology programs have also been joined, creating synergies in various areas. In 2016, we treated >500 inpatients, >1.500 outpatients and >300 patients in the infusion outpatient clinic, often as part of clinical studies. The program collaborates closely with the clinical neighboring disciplines Neuroophthalmology, Neuroradiology, Neuropathology and Immunology, as well as the neurobiological groups on the campus. It ranges from experimental studies in animals to basic immunological and neurodegenerative mechanisms of MS and optic neuritis, cereobrospinal fluid analytical and imaging examination, immunoregulatory mechanisms in MS, the pathophysiology of auto antibody-mediated diseases of the CNS such as neuromyelitis optica (NMO) and autoimmune cerebellar ataxia, and experimental intervention studies in MS, NMO and brain tumors. These strategies will help to implement new diagnostic and therapeutic concepts directly into patient care. The Neuroimmunology team is committed to pass on latest findings and insights to colleagues (“MS-Update“, annually in September) and patients (annual MS Patient Day in January) in the Rhein-Neckar region. 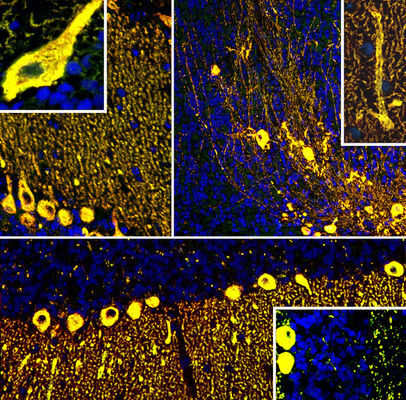 Detection of binding of IgG auto-antibodies against the Inositol-1,4,5-trisphosphat receptor Type 1 (ITPR1) from serum of a patient with acute autoimmune cerebellar ataxia, to dendrites, somata and axons of cerebellar Purkinje cells by indirect immunofluorescence. Red fluorescence: commercial antibody against ITPR1 (detection by a secondary antibody conjugated with Alexa Fluor® 568); green fluorescence: patient antibody (detection by a secondary antibody conjugated with Alexa Fluor® 488); yellow areas: overlap of red and green fluorescence caused by binding of the two antibodies to the same target protein; blue fluorescence: nuclei (DAPI). The scientific activities of the Neuroimmunology Program include the analysis of basic mechanisms leading to the development of MS and opticus neuritis in animal models (Fairless J Neurosci 2012; Lanz PNAS 2013; Hoffmann J Neuropathol Exp Neurol 2013), examination of principal immune cell dysfunctions in patients with MS, identification of new biomarkers in MS immune therapies (Haas J Immunol 2007, Haas J Autoimmun 2011, Haas Mult Scler 2016, Schwarz J Immunol 2013, Balint Neurology 2013; as part of the BMBF-funded Clinical Competence Network on Multiple Sclerosis (KKNMS)), establishing new imaging parameters to monitor the development of neuromyelitis optica (Laible PLos One 2016), as well as the implementation of investigator-initiated multicenter studies (Diem BMJ Open 2016). Close collaborations exist with the Neuroradiology department in the area of high field animal MRI. Besides funding through the Excellence Initiative of Heidelberg University and the Helmholtz Association (W3Professorship and Helmholtz Young Investigators Group for Experimental Neuroimmunology, Michael Platten), the program received significant structural reinforcement in late 2015 through the acquisition of the DFG group FOR2289 (“Calcium homeostasis in neuroinflammation and -degeneration: New targets for therapy of multiple sclerosis?“; Speaker: Ricarda Diem). With initial funding of €2.7m the group commenced work in January 2016. Institutions involved are the Ruprecht-Karls-Universität Heidelberg, the Medical Faculty of the Saarland University, the Medical Faculty of the Westphalian Wilhelm University Münster, and the University Hospital Hamburg-Eppendorf. The group consists of scientists from various institutions and disciplines, i.e. anatomy, biophysics, neurobiology, pharmacology, physiology, and experimental and clinical neurology and neuroimmunology. Their aim is to recognize calcium-dependent disease processes of MS, to develop innovative imaging methods, and to find suitable targets for new therapies. All the group’s projects combine electro-physiological, molecular and cell biological methods, state of the art microscopy techniques and/or experimental contrast-enhanced imaging techniques in animal models. The visual system is of particular interest: It is usually affected in the course of MS and an inflammation of the optic nerve is among the most frequent initial manifestations of the disease. Besides playing a leading role in international multicenter registry studies, we are conducting – based on results of a randomized Phase II study (Sühs Ann Neurol 2012 - a BMBF-funded multicenter randomized phase III study (TONE; Diem BMJ Open 2016). This trial examines whether erythropoietin prevents the death of nerve cells in the retina during the early stage of optic neuritis. Represented by the group of Brigitte Wildemann, the Neuroimmunology program is one of the world’s leading centers in the area of antibody-associated inflammatory diseases of the CNS, in particular of neuromyelitis optica (NMO), and of MOG-IgG-positive encephalomyelitis, supported by the BMBF-funded KKNMS and the Dietmar-Hopp-Foundation. Moreover, as a national coordinator (Eculizumab in NMO, Platten, Diem), the program participates in multicenter therapy and cohort studies (SUSAC syndrome, Wildemann). As members of the KKNMS, the national NMO study group NEMOS and the International Panel for NMO Diagnosis (IPND), members of our group were actively involved in the development of national guidelines for diagnostics and therapy of MS, and the international NMO diagnostic criteria.